The extreme introverting continues. Besides picking up a few groceries and some occasional visits to the gym, I’ve gone out a scant handful of times in the past month. Once I went out to shop for clothing. I did this out of desperation and an acknowledgement that there were times I needed to be able to dress in something other than yoga pants, a t-shirt, and a fleece hoodie. I had to go to the office on days that bookended that weekend, and when I realized I literally had only one stretchy skirt that would fit me, I went out to find some more suitable work wear for my current body. A kind friend keeps reminding me that I have had two major surgeries in a year and that it will take some time to get back in shape. Yes, it’s true that in a one year time span I had two surgeries that resulted in the removal of my uterus, both ovaries and fallopian tubes, 10 inches of colon, and my appendix. Logically one would think that taking that many organs out of my body would result in a loss of weight, but that’s just not the way the world works, sadly. I suspect that I shall never be the same shape again due to the hormonal shifts I’ve been through, but we’ll see. Anyway, I went to some shops and bought some things to wear. A couple of pairs of pants, a few blouses, and one of those swingy sweaters that can be worn as a jacket. Because I recalled that my office has adopted a “jeans Friday” thing all year-long, I was able to wear a pair of jeans and a plain t-shirt on the Friday I went to the office, and I was able to wear one of the blouses with the one skirt that fits me when I went into the office on the Monday. Crisis averted. Sister was in town a couple of weeks ago and she brought her lovely daughter with her. (Niece is turning 30 this year, so she’s not a child.) While I did have to work most of the week, I was able to spend a Friday afternoon, Saturday, and Sunday with them. We enjoyed the break in the weather by doing a lot of touristy things in San Francisco, as this was niece’s first trip out to these parts. I hope she comes back often as she really is a well-adjusted and fun person to be around. These excursions from my hidey hole are fun, but they still exhaust me. Last week I was tired all the time and just couldn’t seem to get enough sleep. I’m sure having meetings that necessitate me setting my alarm for 4:30 or 5 AM every damn day of the week doesn’t help, either. For a while there the early morning meetings were only happening twice a week, but now they are happening nearly every work day. Ugh. But today I really want to move away from all this negative crap and instead recognize my boon companion, my wonderful dog Hannah. In a recent Twitter exchange, I was reminded that she and I have been together 13 years. Wow. My dog and I have had a relationship that’s lasted longer than my marriage; longer even than some of my human friendships. Hannah is roughly 14 years old and is doing quite well for a someone who would be about 78 years old as a human. She loves to go on walks, play “keep away” and “tug” with her toys, chase squirrels and cats, and get belly rubs and petting from humans of all ages, shapes, and sizes. She still does not like other dogs to get close to her or even show interest in her, but we’ve diligently worked on keeping her from getting reactive 95% of the time. Nearly two years ago some blood tests revealed that Hannah has an elevated ALT, which is a measure of liver health. When the elevated results persisted and even got a little worse, there were ultrasounds and eventually a biopsy performed, but there doesn’t seem to be any underlying disease causing the issue. So for now we just monitor the levels and I give her a daily medication that is helping to keep the ALT from climbing quickly. In the past 6 months I’ve noticed that she has some issues with slightly dragging her rear feet when she walks, and her gait hasn’t been as smooth. The veterinarian suggested she has arthritis in her lower back, based on examination and manual manipulation. She recommended some medication, and also suggested I may want to consult a vet who does acupuncture. Now Hannah gets electro-acupuncture treatments roughly every 3 or 4 weeks. (Acupuncture vet thinks that Hannah may actually have a disc issue rather than arthritis in her back, but since the treatment is the same I really don’t care to have her x-rayed to confirm either diagnosis.) Between the medication and the acupuncture she seems to be doing better. She’s surprised me by leaping over the back of the couch a few times during play or in enthusiastic greeting. Acupuncture vet also recommended some changes to Hannah’s food, which I slowly adopted. While I’m not willing to cook my dog’s meals daily, I did switch her to a quality kibble that uses beef as the first ingredient rather than chicken. I’ve also started adding more real food to her bowl. She’s been getting a soup-spoon full of canned pumpkin for a few years (it helps her from getting constipated), but now I’m adding cooked kale, and canned sardines every morning. Those sardines are like a superfood, and I’m really impressed with the condition of her skin and coat now. For many years she’s had bald spots on her tail. When I asked the vet back in Chicago about them she suggested I put Hannah on fish oil. I’ve been giving her a fish oil capsule every day since then and there had been a slight improvement. But now that she’s been on the sardines for while those bald spots are completely gone and her coat is softer and shinier. I’m now singing the praises of sardines to every dog owner I meet. Hannah and I have gotten to know each other very well over our years together. She is an excellent communicator. When she thinks it’s time for a walk, she noses her leash and looks at me. When she wants to play she gets my attention by walking up to me first, then when I look at her she walks over to her toy shelf and pulls out a toy. If she thinks it’s time for her dinner or for bed, she walks up to me and “sings” a little bit to get my attention. She also grabs my attention by flopping herself noisily onto the floor near the sliding door into the yard when she needs to go outside. She only barks to alert me when a person, dog, or cat comes near the house or into the yard. Otherwise, she “sings” or whines very softly to get my attention. Hannah’s ability to read my moods is also exceptional, and she’s a great “comfort dog.” I hope we have many more pleasant years together, and I send out gratitude every day that she is here with me and is staying so healthy. I’m at my house now. My own house. My home. It’s just for a few days until Mark gets back from a business trip, but it’s sort of like a little breather in the middle of a long stretch of craziness. As I sit here on my couch, with Sadie curled up on my left peacefully sleeping, and Hannah curled up on my right, sleeping in her usual twitchy, I’m-chasing-something-in-my-sleep way, I’m loving it. I’m surrounded by their healthy, doggy smell, and the warmth of their presence. 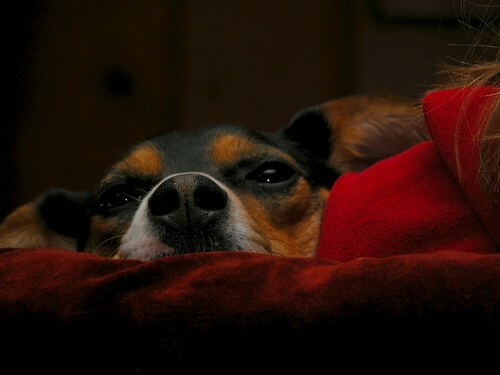 It will be so nice to climb into my bed tonight knowing that my wonderful dogs will be snuggled up with me. While I get this time just for a few days this week, it’s great to know that in about 10 days I can look forward to this again, and again, and again, etc. At this time of year I’m usually kicking back and enjoying my garden. The spring is usually the time of year where there is lots of hard work in the garden. But this year the cicada scare in the area delayed things quite a bit. I went round and round with the landscaper about when to have the plan for the back yard (the one behind the house) finished, and we’ve only just now settled on a date later this month. High summer is usually not the best time to plant, but I’ll get the soaker hoses down right away and use them liberally while the plants are getting settled in. One task that I had thought to “outsource” through the landscaper was constructing raised beds in my side yard (or as it’s affectionately known, “The Point”). I’ve only had to make about 6 very careful applications of herbicide so far this year to keep the bindweed out. (I use a technique that involves “painting” it on the plant to minimize the amount used and the impact on anything else.) So, The Point is ready for its transformation! Here we see the full lot at the beginning of its change from weed-infested lot into my food-raising area. In the foreground are some cinder blocks and large branch marking out the dimensions of a bed we’ll put in for blueberries. I’d like to have 2-3 blueberry bushes, so it will have to be fairly deep and long. I won’t use cinder blocks because they’d have to be stacked pretty high and would require re-bar reinforcement, so I have something else in mind. Moving clockwise, a few more stacks of cinder blocks mark out the dimensions of the asparagus bed. Again, I likely won’t use cinder blocks since this will be a pretty deep bed, too. At the far back is the single bed I constructed this year. Heaps of edging blocks are laying around, awaiting my artful arrangement of them into outlines of future beds. We’ll build the blueberry bed, one for asparagus, and one more for annual veggie rotations this year. The rest will have to wait for future years, but I want to have a plan for where to put them. 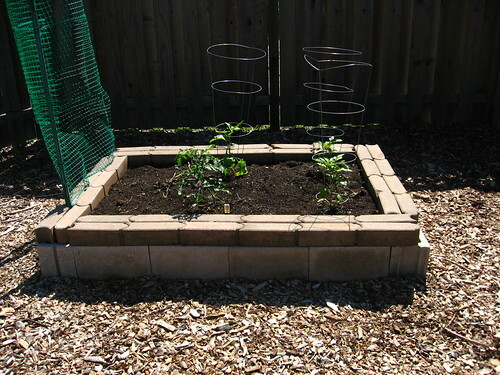 An interesting note about raised beds: when I decided that I had to do the beds without the landscaper’s help, I Googled “raised beds” to see what sort of products and info I could find. One of the results was from a site called WikiHow. 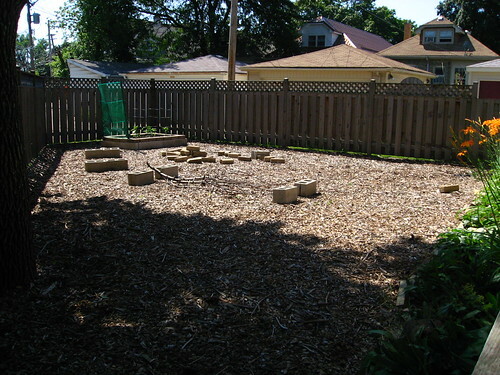 It has step by step instructions on how to build a raised bed, and photos for examples. I thought the photos looked familiar at first glance, and then I realized they were photos of raised beds that we constructed a year or two after moving to this house. Mark would have taken the photos, and I must have posted them somewhere. They’re not on Flickr so I can’t recall where they were uploaded. I was out with the camera today, so there are more photos to see on my Flickr account in the 2007 Garden set. I took a few photos of the dogs, too. I can’t resist posting just one. 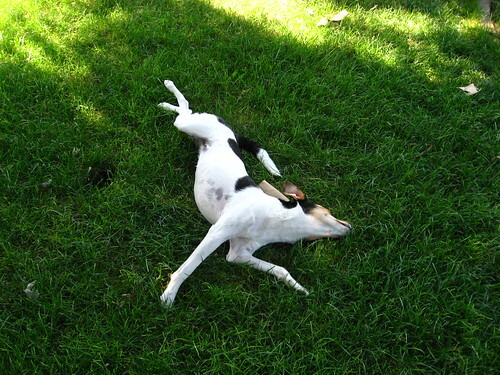 Sadie loves to do this crazy spinning round and round thing in the grass and on the rug. She looks so goofy doing it, but clearly loves the sensation! Live in the moment. Forget the concepts of “future” and “past.” There is just NOW. Enjoy it. Endure it. Get through it, but take it all in, good and bad. Live it. I deserve every bit of attention I can garner. Don’t doubt that at all. If you can grab attention through some antic — vocalization, movement, crowding — grab it and enjoy it. After laying down for a period of time, always stretch when you get up. Listen and intuit with your entire being. That’s the way to connect to others, to life, and to find enjoyment in the now.